Students’ sights were set firmly on the future during National Careers Week when more than 120 universities, training providers, local employers and gap year organisations visited Barton Peveril. The College’s well-established Higher Education Fair brought over 70 universities and colleges from throughout the UK together under one roof. As well as picking up prospectuses – and the occasional freebie – first year students were able to quiz representatives about entry requirements, course content and student life before doing more research online and planning open day visits. Around 600 year 10 and 11 pupils from local schools also visited the event. Later in the week, Futures Day provided a one stop shop for students interested in apprenticeships and work-based training schemes. Local representatives from the banking, investment, accounting, insurance, construction, computing, legal, residential care, engineering and hospitality industries joined music colleges, sports academies, gap year organisations and the armed services to guide students through their options and help clarify next steps. Among the people manning stands were several former students who applauded the College’s firm focus on future opportunities and recalled the importance of researching any area of interest as thoroughly as possible. 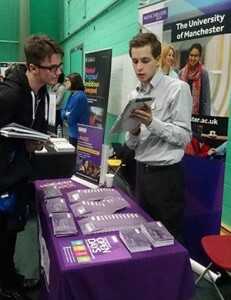 Connor Barnett, left Barton Peveril in 2008 with A Levels in Psychology, Sociology and PE. Now he manages the Winchester branch of NatWest bank where another former student, Andy Naylor, is a customer service advisor. 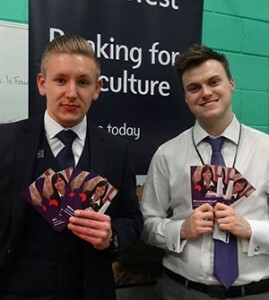 Asked what advice he would give to current students Connor (pictured left) said: “It’s all about knowing what opportunities are out there and where they might lead once you’ve got your foot in the door.